Disney's MINNIE-RELLA on DVD Feb 11! I have a soft spot for Disney characters acting out famous tales, such as Minnie's The Wizard of Dizz (The Wizard of Oz), which I wrote about last year. It's just so cute to see our favourite characters in costume. So, when I heard that Mickey Mouse Clubhouse: Minnie-rella (Cinderella) was coming to DVD, it made me go "aww"! Just check out Minnie Mouse as Cinderella in a beautiful ballgown, sparkling slippers, and matching hair bow! The dapper Mickey Mouse looks distinguished as Prince Mickey (Prince Charming), and golden crown. Of course, the story would not be complete without the comical antics of Donald Ducky and Goofy. Mickey Mouse Clubhouse: Minnie-rella comes to DVD on February 11th! Check out a VIDEO clip of this cute DVD, below! "Poor Minnie-rella needs help to get ready for Prince Mickey’s Royal Ball! With a wave of her wand, Minnie-rella’s Fairy Godmother, Clarabelle, transforms a tomato into a spectacular carriage and Minnie-rella’s tattered dress into a breath-taking ballgown! But Minnie-rella’s magical dance at the ball with Prince Mickey ends when the spell is broken at midnight, and she runs off leaving a glass slipper behind! Prince Mickey must find the princess who fits into the lost glass slipper: Minnie-rella!" 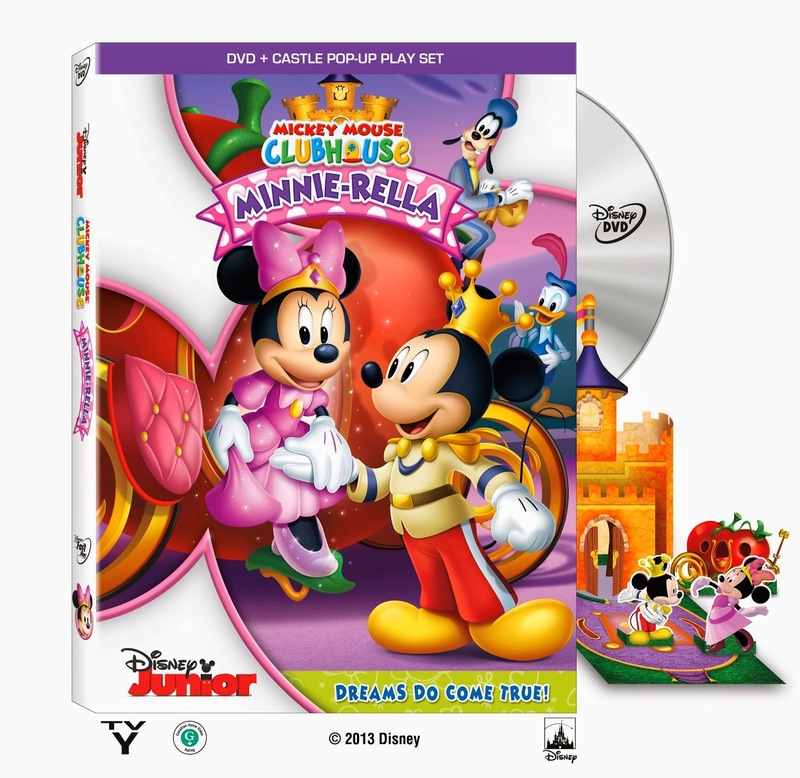 The Mickey Mouse Clubhouse: Minnie-rella DVD includes the full-length Minnie-rella adventure, a FREE Castle Play Set, 3 additional Mickey Mouse Clubhouse episodes and 10 Minnie’s Bow-Toons Shorts! If you have a child or grandchild between the ages of 2- to 6-years old, I would recommend Minnie-rella for boys or girls! WIN 1 of 2 copies of Mickey Mouse Clubhouse: Minnie-rella on DVD from SnyMed.com! Contest open to Canada & USA, and ends on Monday March 17th, 2014. Leave a COMMENT below stating who has your heart:: Minnie or Mickey OR who you'd like to win this DVD for. Then, use the entry form below, to enter the contest. Why Comment? If your winning entry is done incorrectly, I give you the benefit of the doubt if you have left a comment. GOOD LUCK! would love to win this for kaelyn she loves minnie mouse! My sweet princess would love to win this! We've watched it 10 times today! I like Mickey Mouse. And my sin would live this. I would love to win this for my daughter - she LOVES to read the Minnie-rella book! I love them both,they are the cutest couple ever! Mickey has my heart ! Also I would love to win this for my little sister ! <3 She watches Mickey and Minnie everyday ! I'd like to win this for my little granddaughters. Mickey and Minnie have been a classic duo since I was a child. My grandbabies would love this whenever they visit grandma and grandpa. My daughter would love this movie. Daisy duck is her favorite but Minnie is a close second. Would love to win this for my daughters!!! My daughter loves Mickey Mouse, it is her favorite show! i love mickey!! my son would love this!! Hotdog hotdog hot diggity dog!! I love Minnie and my daughter would love this. Minnie for sure. My daughter has slept with a Minnie stuffy for two years now. I would love to get this for my boys. They really enjoy watching Mickey and all of his friends in the Clubhouse. I love Minnie and so do my twin girls. They would love to watch this! My child would really love this. Mickey all the way. I am trying to win this for me! I'm a Minnie fan and so is my middle daughter - I'd love to win it for her! I have a heart for all things Disney so it would be hard to choose! My 4 year old daughter would LOVE this! Minnie of course. My grandchildren would this. I like Minnie Mouse the best because she is so cute,just like the little girl I would love to win this for. I would like to win this for my grandchildren. They are fans of anything Disney. Mickey, and I'd love to win this for my daughters. I would like to win this for the little four year old that I babysit. My son loves both Mickey and Minnie! Mickey had my heart! Would love to win this for my Minnie! Minnie has my heart, she always has. And while the DVD would be for my girls, secretly kinda for me too - I love those guys still!